Having provided on-line event booking for a client for several years now, we were discussing the other day where its customers came from and how far they were prepared to travel and, in particular, our own feeling from dealing with ticket enquiries, that some of the customer's events attract a national audience whereas others are much more local affairs. Hunches are one thing but businesses can gain extremely valuable insight from actually looking at some hard evidence... and it occurred to us that we had several years' worth of data going back. Using postcode and mapping data now available from the Ordnance Survey under the new OS OpenData licence, it took under an hour to come up with a simple GIS plotting application, overlaying map pins onto UK mapping. Our prototype's run-time won't win any prizes but a day with a server left churning away produced a set of detailed and interesting maps. It's clear that there's a lot more that could be done on this theme, such as highlighting new and regular customers, plotting pictograms representing the number of persons in each booking or the total spend or animating different maps to show trends over time, and we hope we'll be able to take our first simple application further. If you'd like us to suggest what we could do with your data, please drop us a line. Along with Chutes, we've produced a 32-bit version of our old Balloon Girl screensaver since someone asked. For anyone looking for other bits of retro chic from our distant past, drop us a line and we'll try and oblige. And if you want a properly written custom Windows screensaver for your business or event, you know where to find us. The real-time ticket booking service we developed for the Fairyland Trust is back live selling tickets for this year's two day Fairy Fair event. The system has worked so well for events over the past four years that this year the charity has opted to make entrance available by advance booking only. As well as handling adult and child entrance tickets, the system allows pre-booking of a range of different workshops and activities during the event with a live availability display and payment via RBS Worldpay including optional Gift-Aid and donation. This year, we also introduced discounted tickets sales for the trust's regular supporters for a period of time as well as a new Family ticket option for groups of two adults and two children; the system looks at the numbers of adults and children in the group and automatically calculates an optimum set of family and normal tickets to give customers the lowest booking price. Please get in touch if you'd like us to help sell seats and tickets for your performance, concert or other event on-line. See the Fairy Queen in Holt Hall woods - 30 and 31 May 2010! 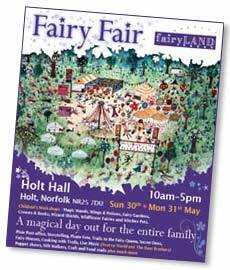 Just a quick mention that the Fairyland Trust is holding a Fairy Fair in the grounds of Holt Hall at the end of May. This deserves a mention here firstly because it really is, based on personal experience, a magical day out for families with young children, and secondly, because from 1 March 2010, you can once again book tickets in advance on the web, courtesy of a custom real-time booking system which we first developed for the Trust in 2008. This multi-user real-time booking system both issues entrance tickets and pre-books individual workshop sessions for either of the fair's two days, drastically reducing delays and crowding at the fair's entrance by removing the scramble to book workshops on the day. Payments are handled securely by the RBS Worldpay service and the software issues PDF-format tickets on-the-spot after payment, as well as sending an e-mail confirmation to customer's from which they can collect their tickets at a later date if necessary. With major works underway to accommodate crew and work vessels for windfarm construction of the North Norfolk coast, Wells Harbour Commissioners wanted the port's popular website updating and expanding to make to make it easier to keep the public up-to-date with progress and to make relevant documents available for stakeholders and other interested parties. Strange took the opportunity to revamp the look and feel of the site at the same time as providing a comprehensive content management system that allows the harbour staff to update and publish news and notices as well as upload reports and other documents for download by visitors to the site and manage a more detailed diary of upcoming events. Our news management software, which has been running on the site for six years, has been greatly enhanced and integrated into the content manager and now handles multiple photographs with automatic resizing and captions, automatically formatted intro and full-length pages, multiple different news feeds and sections and an automatic archiving facility. The file and document manager allows PDFs, Word documents, images and other files to be uploaded into a flexible folder structure. Documents are then shown in the relevant sections of the website with an an appropriate icon, an optional full text title, description and date and automatically created links which will open the document in the user's browser or prompt to download it to their computer. 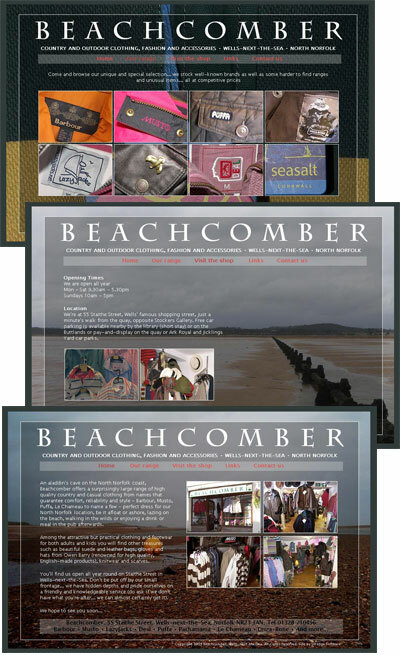 While greatly expanded and rearranged, the site retains many user's favourite features, such as webcams and a busy guestbook, and continues to attract regular visitors from all over the world. A new database developed for Cambridge-based firm Aeropeople has gone live on the customer's site. Strange developed the tailor-made application using C, MySQL and Apache to track and manage details of overseas workers placed on a variety of contracts across the UK, including personal information, such as contact details, passport, certificate of sponsorship and training records, housing accommodation and travel arrangements and a holiday booking system. The database replaces information held and updated manually in a series of tabbed Excel worksheets which had proved time-consuming and error-prone in the face of a growing workload. As well as being difficult to access by several team members at once, the lack of structure in the spreadsheets made it difficult to keep information up-to-date and consistent and meant that some reporting and management requirements were intensive manual operations or simply not practical. In contrast, Strange started by designing a relational database, implemented in MySQL, that accurately modelled the real-world elements of the application, such as workers, contracts, houses, leases, landlords, agents and holidays. This formal approach means the new database not only provides accurate current information but builds up valuable historic data over time, such as a history of a worker's previous employments and addresses, or a list of previous tenants in a particular property. 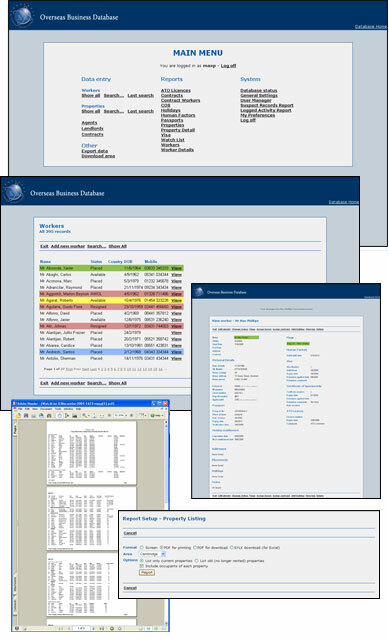 The database was implemented as an intranet application running with Linux, Apache and MySQL with a front-end, data entry and reporting application written in C. The client's network normally uses Microsoft server technology but the client was able to implement a virtual server for the new system so that it can run independently across their LAN without interfering with other systems or causing security concerns. End users access the system through their normal desktop workstations and web browsers. Firewalled remote access from the client's other offices or even from the staff's home PCs or personal laptops can be enabled if necessary and is used to allow Strange Software consultants remote access to the database trouble-shooting and maintenance. The system includes a large range of reports can be accessed with a few keystrokes and mouse-clicks to suit various requirements both internally and externally for clients. A number of new reports that were not possible with the existing Excel system are now available on demand. Reports can be displayed on-screen directly to the operator's browser either as web pages or as fully-formatted and directly printable PDF reports. PDF format reports can also be written to a files area so that they can be downloaded and e-mailed or further processed as necessary. A further output option for most reports is as a SYLK export file which can be directly downloaded into Microsoft Excel. This provides an easy and very open way for staff and managers to download specific report data for further processing or presentation and reporting as required. (It was odd to work with Microsoft's now very old SYmbolic LinK SYLK file format after all this time but it proved a reliable and very direct way to generate reasonably formatted Excel worksheets that can be opened directly from user's web browsers with a single click!) The database also includes a more formal ASCII-delimited export facility to offer an easy way to extract the underlying data should it ever be required. The database is fully multi-user providing password protected access to nominated members of staff. Several different levels of account are provided so that certain data and operations are only available to users with appropriate privileges. As is our usual habit, the system has comprehensive logging and tracking built-in for both debugging and data security purposes; all operations amd queries on the database are recorded by date, time and user. At the client's request, this was implemented down to a 'field-and-data' level so that, for example, it is possible to see not only which operator amended a record and when but also which fields they changed and from what to what! This provides a valuable mechanism in addition to normal back-up techniques. For example, if an operator mistakenly keys an incorrect phone number over a good one, it is possible to see what was entered, when and to recover the previous value. Another unusual feature is a colour-coded flagging system that allows individual records in the system to be highlighted, a feature partly carried over from the original Excel worksheets where staff had used row background colours to flag particular information, such as workers who had been dismissed or who were not presently available for work. 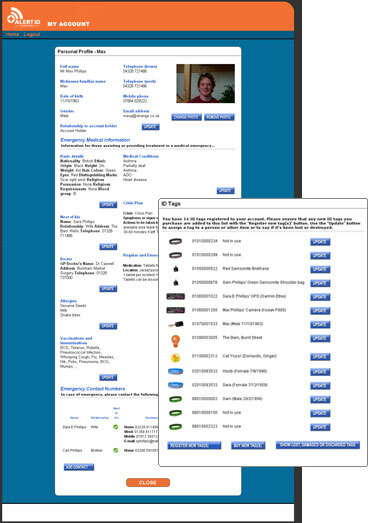 Managers can enter labels or meanings for particular flags and the relevant colours are used to highlight records both in query listings and editing screens. In addition to the software design and development, Strange Software worked extensively on an export of the existing data to provide an initial import dataset for the new system. 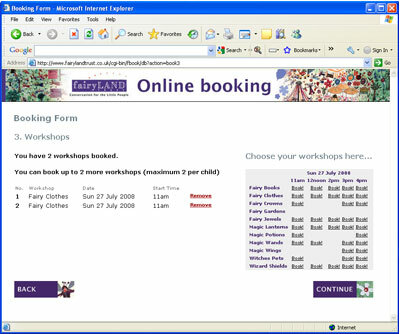 This was a major task as the original Excel worksheets were not well structured and custom software had to be created to both to match records up (for example, a fuzzy search by name, surname and birthdate across mulitple sheets for all information relating to a particular contractor) and to generate new fields (for example, reading row background colours in the worksheet to create input values for new status fields). Strange then worked with the client's staff to eliminate outstanding issues and inconsistencies brought over from the existing data. A special 'suspect records' report was included that lists records that appear to be out-of-date, incomplete or inaccurate... it took several days to work through the issues this initially raised but allowed the staff to thoroughly clean up the database and start work with a much better quality dataset. Work has continued, since its launch last year, on the Alert ID database and web front-end. An enhanced version of the software provides an easier and more structured framework for storing personal and medical information relating to family members, including photographs, pick lists of common allergies and conditions and 'hotlinked' contact data (for example, if mum changes her mobile phone, her new number is reflected automatically on the profiles for dad and the kids). The system is now able to track ID tags and related information for personal property, pets and vehicles as well as people. Customers can also enter holiday and travel itineraries so that response centre operators can more easily reunite lost items (or, for that matter, stray dogs and children) with their families while they are travelling. The database has established an excellent availability and reliability record, and has coped comfortably with thousands of accounts related to a variety of products and services now being offered by Alert ID and its partner companies. 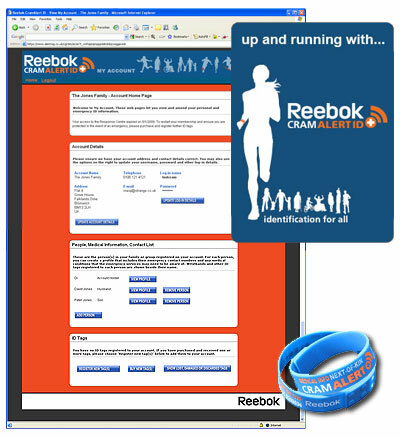 A major new database and web application developed by Strange Software for Alert ID Services has gone live on time, to coincide with the launch in press, radio and TV of a new emergency personal ID service, promoted in conjunction with Reebok and Steve Cram. Initially intended for runners but with a much wider appeal, customers buy and wear durable personal wristbands giving both an emergency hotline number and a unique personal identification number. Customers details, linked to the tag number, are stored in the database accessible to staff at a 24-hour response centre... in the event of a person being found injured or unwell, the response centre can both contact relatives or next-of-kin as well, in appropriate cases, pass important medical information to the emergency services. One or more people from the same family or group can be registered on each account on the system, each with their own personal id bands, and a customer log-in allows the account owner to amend and update the information for all family or group members at any time over the web, ensuring that contact and medical information is kept up-to-date. Underlying the system is a multi-user SQL database with custom applications written in C. These firstly provide Alert ID staff with rapid access to customer records in the event of an incident. The system creates a flexible record of each incident, allowing staff to record details of the situation and their responses. Automatic reminder lists of 'open' incidents ensure that staff keep trying where relatives or other persons cannot be contacted first time. A browser-based front-end with appropriate security and firewalling allows the system to be used from different sites so that, for example, night-time calls can be handled by a different staff to day-time. A separate web application provides a customer portal to the database, providing access via username and password to that customer's specific account only, through a friendly and easy to use web-interface. The system also interfaces to company's sales website, pre-loading customer details taken at the time of purchase so that they are available when the customer receives the product and first logs onto the system. The Fairyland Trust contacted us about a difficult problem... thousands of visitors arriving each morning of its popular Summer Fairy Fair event and trying, en-masse, to get the best remaining tickets to whichever workshops their children most wanted. The solution was to develop an advance ticket booking system, similar to that used to sell concert or airline tickets, but adapted specifically to let visitors pre-book their choice of 11 different workshops repeated in five different sessions during each day. Strange's web application used a MySQL database to enable users to first book admission for their party and then choose whatever combination of workshop sessions they wanted from those still available. By providing a live availability display up-front, parents and children could pick which day to attend and get the best choice of their preferred activities. The system enforced a maximum number of workshops per child to ensure fair-play and provided automatic warnings if the choices didn't make sense (for example, booking three workshops at the same start time with only two children attending). Having made their choices, users' bookings were paid and confirmed there-and-then using a secure on-line payment service and an e-mail sent giving the booking details and a link to collect an entrance ticket. Users could then collect and print their own entrance ticket in the form of a colour PDF including their booking details as well as a map and guide to the event. 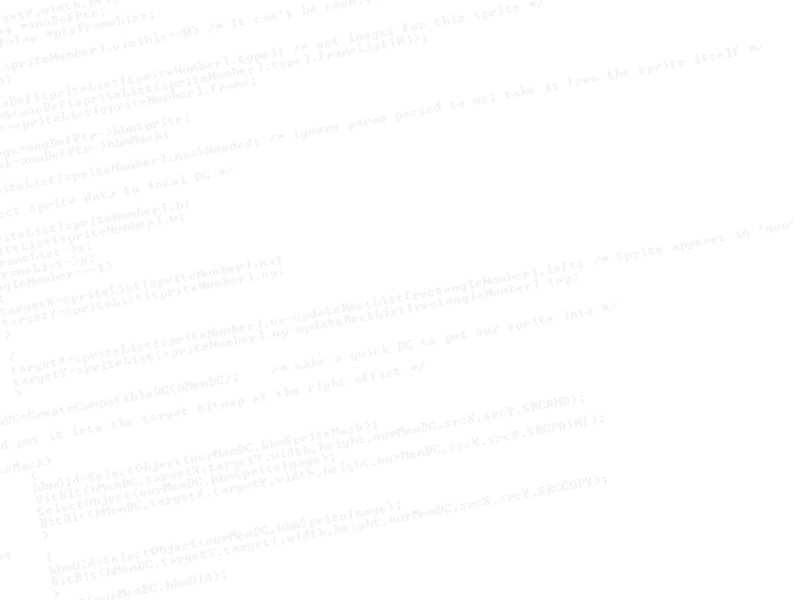 Website ©Copyright 1996-2013 Strange Software Limited. All rights reserved.